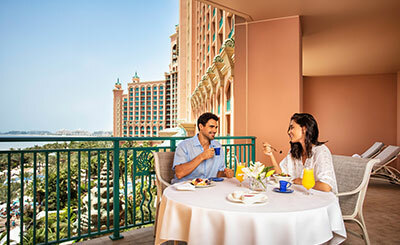 Great Arabian Hospitality Located atop the crescent of Dubai's Palm Island, the 5-star Atlantis, The Palm offers dramatic views of the Arabian Gulf. This mega-resort blends luxury with a pool of interesting attractions to offer delightful stay for holidaymakers of all ages. The resort's lavish accommodation is perfectly in sync with its marine theme and has the refined elegance of Arabian decor. 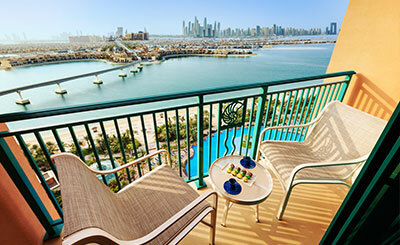 The rooms are equipped with latest amenities and facilities, and have been specifically designed to provide stunning views of the Arabian Gulf or The Palm. Diverse Dining The Atlantis, with its many bars and restaurants, provides a variety of dining choices to guests. 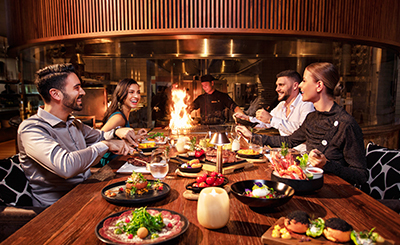 Head to Nobu, the award-wining Japanese restaurant for contemporary Japanese fare; or enjoy Italian delicacies at the resort's Ronda Locatelli restaurant. 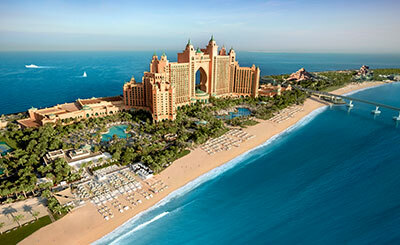 Being one of the top luxury hotels in Dubai, The Atlantis has a host of other speciality restaurants too. Furthermore, a grand selection of luxury boutiques makes Atlantis, The Palm one of the most sought after five star hotels in Dubai. 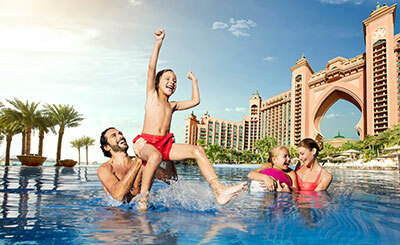 Splendid Attractions Atlantis, The Palm is also home to one of the region's most popular water parks - Aquaventure; the place has loads of fun rides for families. Discover a world of great marine life at the Lost Chambers Aquarium. You can even learn to scuba dive and swim with sharks at the Atlantis Dive Centre. 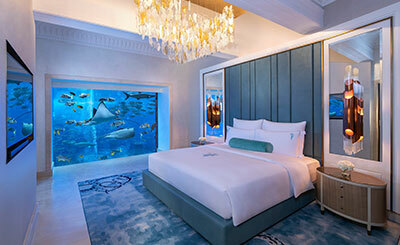 With all this and much more, it's easy to see why Atlantis, The Palm counts among the most popular of Dubai hotels. Atlantis The Palm is a splendid 5-star property located on the Palm Island and is home to Aquaventure Water Park, one of the largest water parks in the Middle East. Dubai Media City, Mall of the Emirates and Emirates Golf Club are all just a 20-minute drive away from this 5-star property. 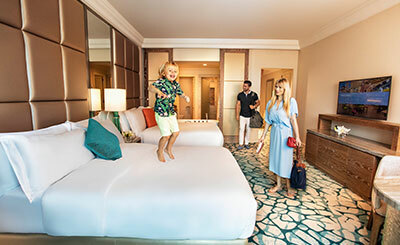 You can enjoy the majestic views of the Arabian Gulf or the Palm Island from the plush rooms and suites of Atlantis The Palm. Rooms here are divided across three main categories namely Deluxe Guest Rooms, Club Suites and Signature Suites. Book the Imperial Club Room for an ultra luxurious stay. 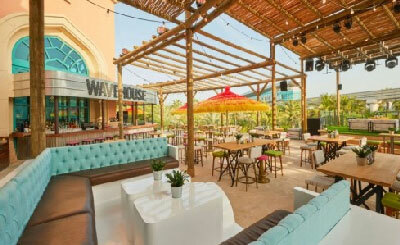 The many restaurants and cafes at Atlantis The Palm offer a memorable dining experience. From casual eateries to al fresco seating and from buffets to special Friday brunches- all kinds of options are available for guests. Ronda Locatelli, Poseidon Cafe, and Kaleidoscope are ideal dining venues for families. Ossiano, Yuan and Nobu are fine dining restaurants where you can enjoy global specialities. Besides Aqauventure Water Park, this 5-star property is home to attractions such as the Lost Chambers Aquarium, Atlantis Aquarium Dives, and Sea Lion Point. If you are new to diving, you can enrol for Atlantis PADI courses. The hotel features a range of outdoor as well as indoor spaces that can be used to host parties, weddings, and conferences.